Genie Chain Glide garage door openers. GCG350L, PRO LCGR-7, LCGR-8, GCG-350, PRO CGR-7, CGR-8, PGC400, PCG450, PCG600, CGR-7 and Python by Overhead Door. Genie manufactured two different rail assemblies for the Chain Glide door openers. One is a Low Profile rail indicated by a letter "L" in your model number. The other is a standard rail. If you are still unsure of part or item you are looking for please Contact Us. Genie Chain Glide carriage for door openers with a standard rail assembly. Genie Chain Glide carriage replacement kit for door openers with a standard rail assembly. Includes 20466R Carriage, 33677A Inner Slide, Master Link and Instructions. Direct replacement for all Genie Chain Glide door openers with low profile rail assembly. L series. Genie Chain Glide Carriage Inner Slide. Direct replacement for Genie Chain Glide door openers with standard rail assembly. For repair use 35263R replacement carriage kit shown above. Both the carriage and inner slide have to be replaced. Genie Chain Glide Inner Slide. Drive gear for all Genie Chain Glide door openers. Worm for all Genie Chain Glide door openers. Gear Cover for all Genie Chain Glide door openers. Lower gear cover assembly for all chain glide models. For use in Genie Chain Glide garage door openers. DOES NOT include lower gear housing (20449R) or gears. For use on Genie Chain Glide Models PCG400, 450L, 500ML, 600, 650L, 700ML, H2000C, GCG350, 350L and 350ML. 1 bushing and 1 washer sold as a set. Used with the gear housing assembly. 1 bushing and 2 washers sold as a set. Used with the worm gear assembly. For use in all Genie Chain Glide garage door openers. Wire clip for Genie Chain Glide and Overhead Door Python openers. Controls most functions of garage door opener. For Genie Excelerator, Overhead Door Overdrive, Genie Chain Glide, and Overhead Door Python models. Secures front end of rail to header bracket. Replacement lens for all Genie Chain Glide door opener models. For Genie Chain Glide Garage Door Openers models ending in L or ML. GCG 350L, GCG 35ML. Rail sections ONLY. (Rail straps, hardware nuts & bolts NOT INCLUDED). Rail Straps for Genie Chain Glide Garage Door Openers. 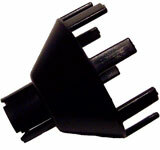 Used on 3-piece retail rail assemblies. Used to join rail sections together. Compatible with model numbers that have an "L" or "ML" in them. DOES NOT include nuts and bolts. The 37220R safety sensors are compatible with all Genie door openers, EXCEPT those that used a 3-pin plug connector at the motor head and internal wiring at the sensors (sensors had to be taken apart to connect wiring), and model 2040L. For model 2040L use 36046R sensors pictured below.